We offer a wide range of Scientific Research Equipment & Instrument that are used in laboratories of an educational institutions and hospitals. Our range includes probes, microscopes, scientific and educational kits and others. These come in both standard and fine finishes. Our expertise and other associated skilled workforce helps us in offering these in varied diameters and variations. 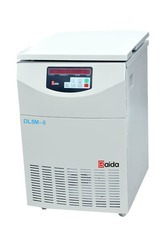 We are offering Lypholizer Freeze Dryer in wide ranges. We are supplying our products to Indian and foreign customers. The model EBT 18N is a research model with -80 deg.C condenser chamber with drum manifold to accomodate 3 inner trays and 8 side arms with round bottom flask attachment. Acrylic drum manifold is with clear view of the product drying and additional two sample probes will allow the sample temperature during drying to assertain the stage of drying. High efficient compressor, condenser and vacuum pump will allow smooth function of the machine as per India climatic conditions with long life. Supply also includes eight number of assorted glass flasks. Top Press In Situ Freeze Dryer is which freeze dried in situ (Patented product).It changes the traditional complicated operation, prevents the pollution of the material realizes the dry sublimation automation. It’s suitable for unit production. The freeze dryer has heating shelf and programmable function. It may remember freeze drying curve so the users can observe this freeze-drying process of material. 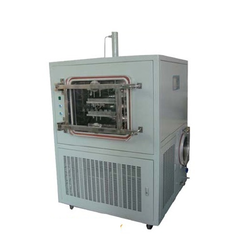 We are a trustyworthy organization offering a wide a gamut of Top Press Silicone Oil Heating Freeze Dryer. 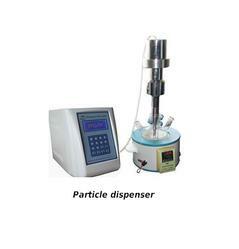 We are a Particle Dispersion manufacturer in India.